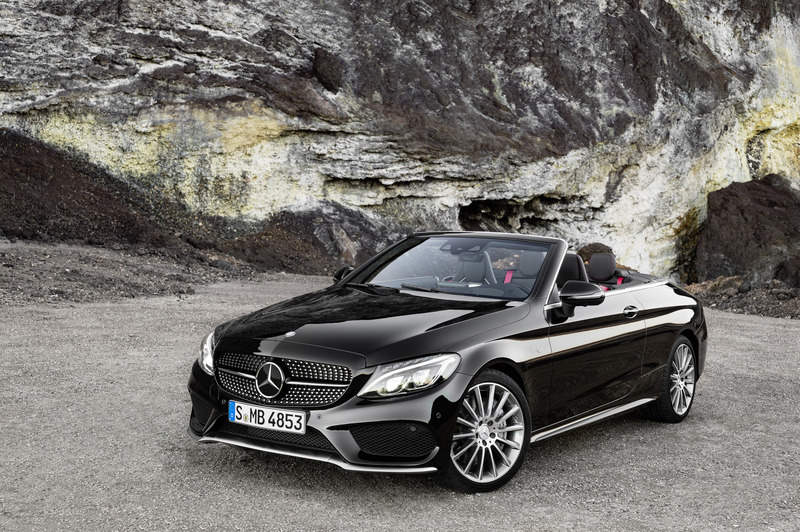 Mercedes-AMG is unveiling the first open-top member of the still young C-Class family in the shape of the new C 43 4MATIC Cabriolet. 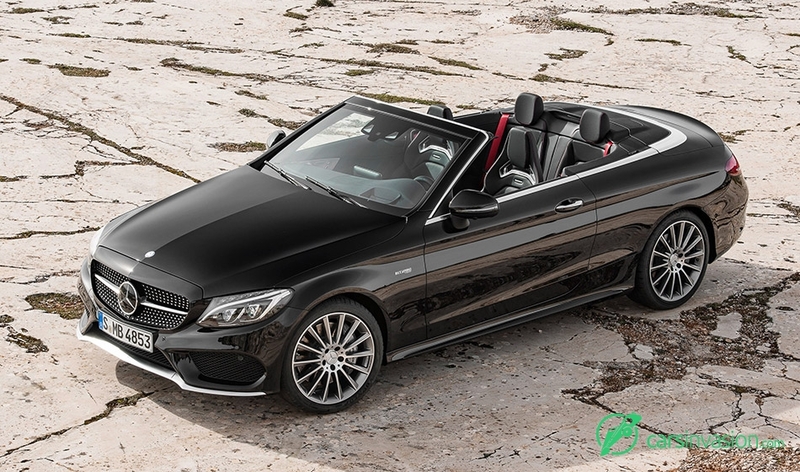 Just like the C 43 4MATIC Coupé, the all-season Cabriolet features a combination of 270 kW (367 hp) 3.0-litre V6 biturbo engine, fast-acting 9G-TRONIC automatic transmission and standard-fit AMG Performance 4MATIC all-wheel drive. The open-air enjoyment for four people is backed by the brand's hallmark Driving Performance thanks to discrete suspension with stiffer elastokinematics unique to AMG and three-stage adjustable damping. 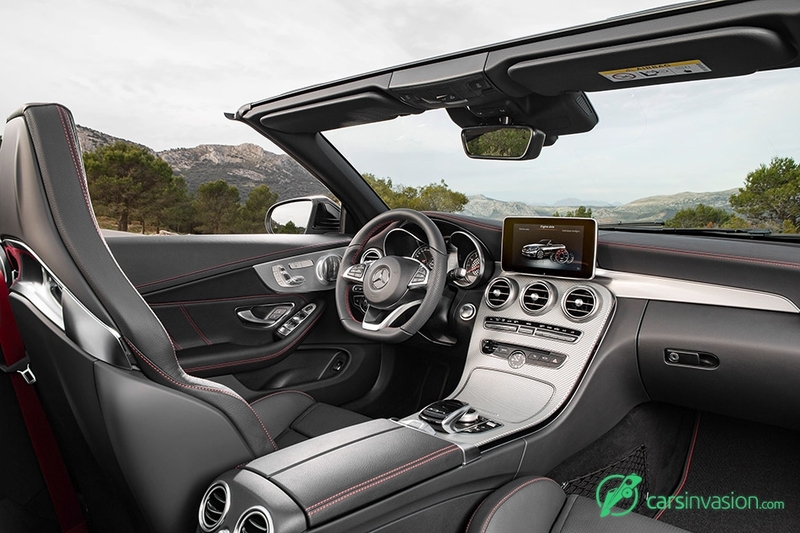 Driving pleasure is accompanied by high efficiency as the open-top version of the Mercedes-AMG C 43 consumes a mere 8.3 litres of fuel per 100 kilometres (NEDC combined figure). 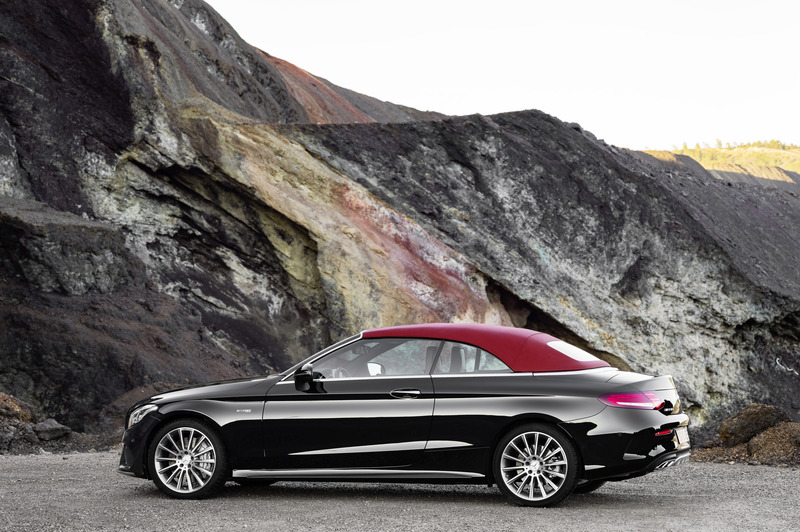 Mercedes-AMG is bringing two models from the C-Class performance family to the 2016 Geneva Motor Show. 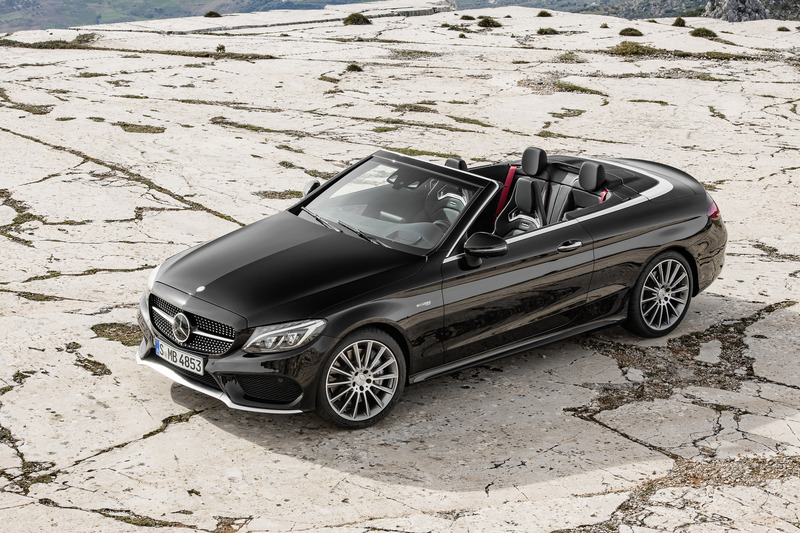 In addition to the C 43 4MATIC Coupé, the sports car and performance brand based in Affalterbach is now also showcasing the C 43 4MATIC Cabriolet. "The AMG product portfolio will continue to grow rapidly this year, making the world of Driving Performance more diverse than ever. 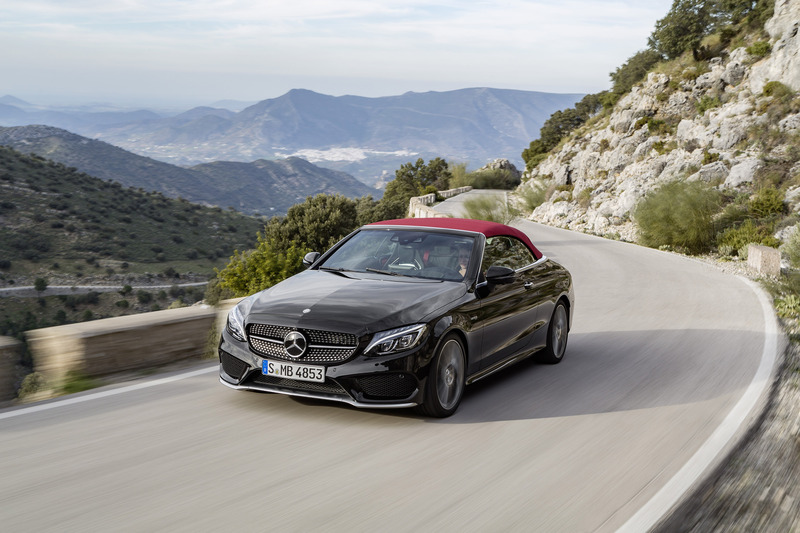 Our new product line continues to expand at a fast pace and, with the C 43 4MATIC Cabriolet, we are offering a younger target group yet another alternative to discover the fascinating world of AMG," says Tobias Moers, Chief Executive of Mercedes‑AMG GmbH. 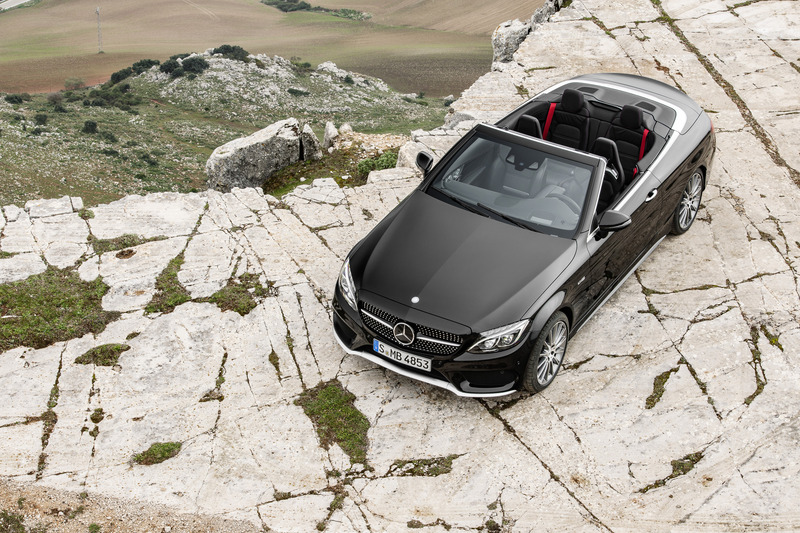 The 3.0-litre V6 biturbo engine in the new Cabriolet delivers impressive performance with its 270 kW (367 hp) maximum power and peak torque of 520 Nm: sprinting from rest to 100 km/h in 4.8 seconds, its speed is electronically limited at 250 km/h. The agile driving experience is mainly thanks to the standard-fit AMG Performance 4MATIC all-wheel drive with rear-biased torque distribution, the newly developed front axle, the stiff elastokinematics and the highly precise steering. 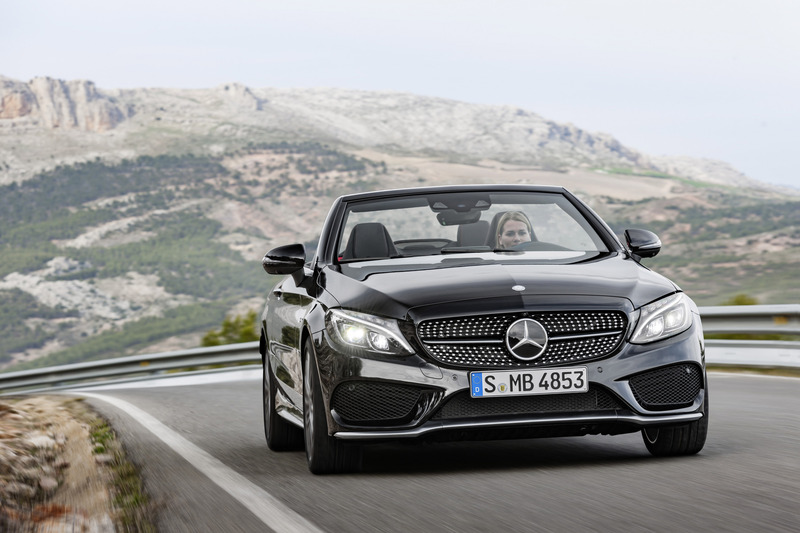 The new 3.0-litre V6 biturbo engine is part of the BlueDIRECT engine family from Mercedes-Benz. Technical advances including a modified boost pressure allowed the AMG engineers to increase the engine's power output and torque as well as its dynamism and flexibility to typical AMG levels. With 270 kW (367 hp) and 520 Nm, the V6 engine sets new standards in its segment. The same NANOSLIDE® coating of the cylinder liners is used in the Formula One engines of MERCEDES-AMG PETRONAS. Especially tough and, therefore, wear-resistant, this coating also reduces friction, thereby contributing to higher efficiency. The AMG powerplant can be identified by the red aluminium insert in the engine cover. 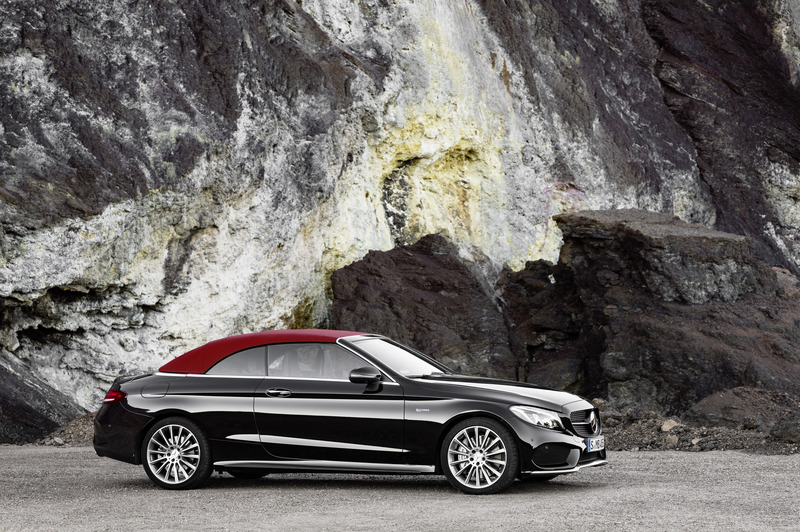 The 9G-TRONIC automatic transmission is specially matched to the demands of the C 43 4MATIC. By specifically adapting the software, the AMG developers have been able to significantly shorten the 9-speed transmission's shift times. The multiple downshift allows faster short bursts of speed, while the double-declutching function in the "Sport" and "Sport Plus" transmission modes makes for an even more emotive driving experience. Furthermore, defined ignition adjustments allow even faster gear changes than in the "Eco" and "Comfort" modes. "Manual" mode can be selected by pressing a button on the centre console. The gear changes are based on the selected transmission mode, and the driver can now change gear using the paddles on the steering wheel. Also, the transmission stays in the selected gear and does not automatically shift up when the engine speed reaches the limit. 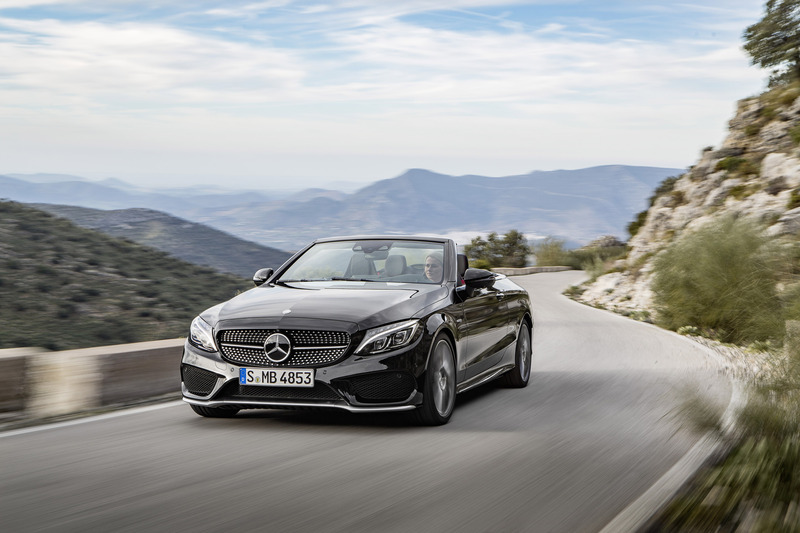 Equipped as standard with the AMG RIDE CONTROL sports suspension with adaptive three-stage adjustable damping, the Mercedes-AMG C 43 4MATIC Cabriolet has all the right ingredients to deliver outstanding driving dynamics and exceptionally high comfort on long journeys. The front axle has been provided with stiffer steering knuckles, improved elastokinematics and increased negative camber. In combination with the likewise newly developed wishbone guide bearings, this design results in significantly more agile cornering plus more precise and direct suspension feedback from the road. The driver can select the automatic adjustable damping system's three suspension modes "Comfort", "Sport" and "Sport Plus" using a button on the centre console to fully customise the driving impression. 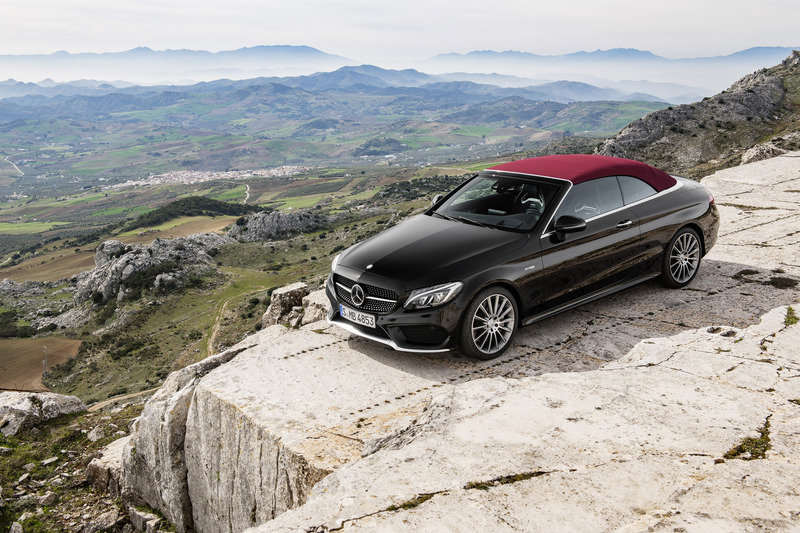 With the five AMG DYNAMIC SELECT transmission modes "Eco", "Comfort", "Sport", "Sport Plus" and "Individual", the characteristics of the C 43 4MATIC Cabriolet can be individualised even further at the tap of a finger. 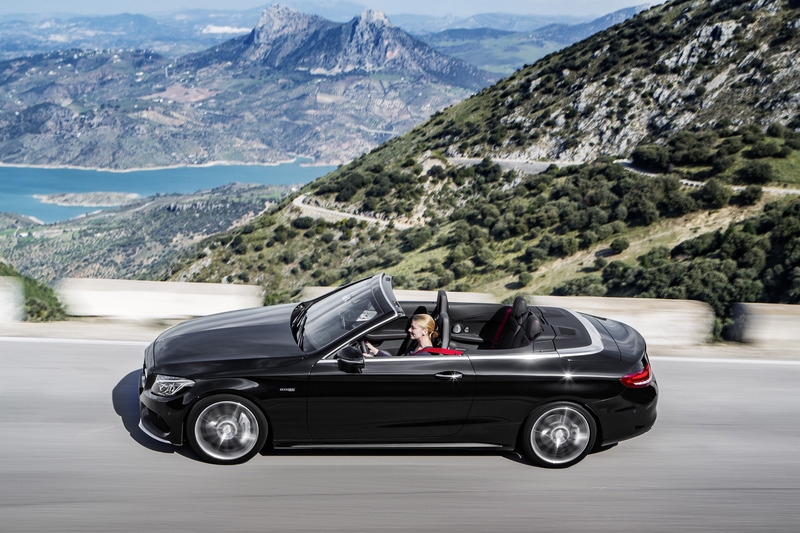 The available range extends from efficient and comfortable to very sporty. This modifies key parameters, such as the response of the engine, transmission, suspension set-up and steering. 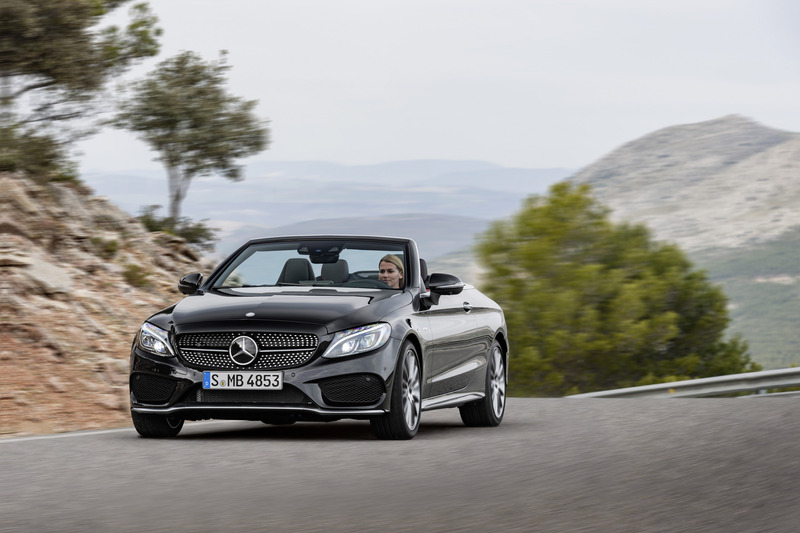 The Mercedes-AMG C 43 4MATIC Cabriolet is likewise sporty in appearance, making it instantly recognisable as a member of the AMG family. 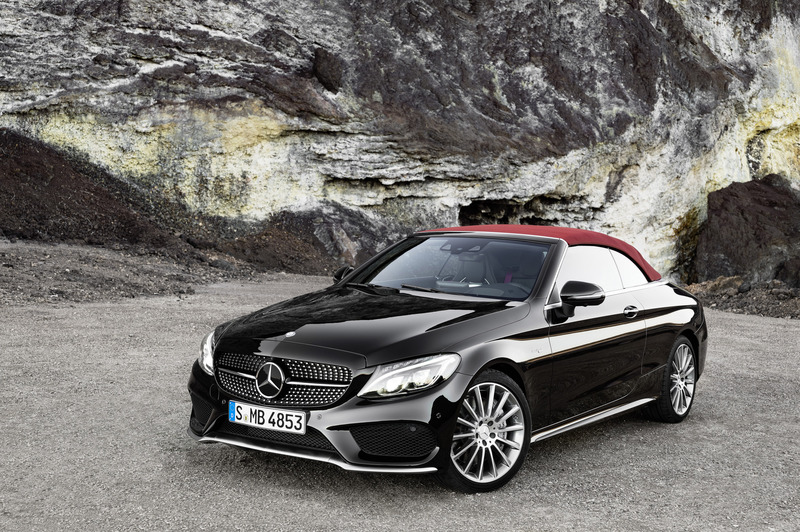 Hallmark features include the distinctive AMG design and the specific light-alloy wheels. They underscore the progressive nature and performance of the brand. The engine cover with red aluminium insert accentuates the strengths of the new twin-turbo six-cylinder engine. The AMG design includes the front apron with sporty distinctive air intakes, diamond meshes, silver chrome trim, as well as the rear apron with matt iridium silver diffuser insert. The diamond radiator grille features chrome-plated pins, a louvre in high-gloss black and AMG lettering. Below this, the silver chrome front splitter ensures an optimal flow of air to the cooling modules. Additional highlights are the black exterior mirror housings, the high-gloss black beltline trim strip and window frame, and the two chrome-plated tailpipe trim elements with centrepiece. 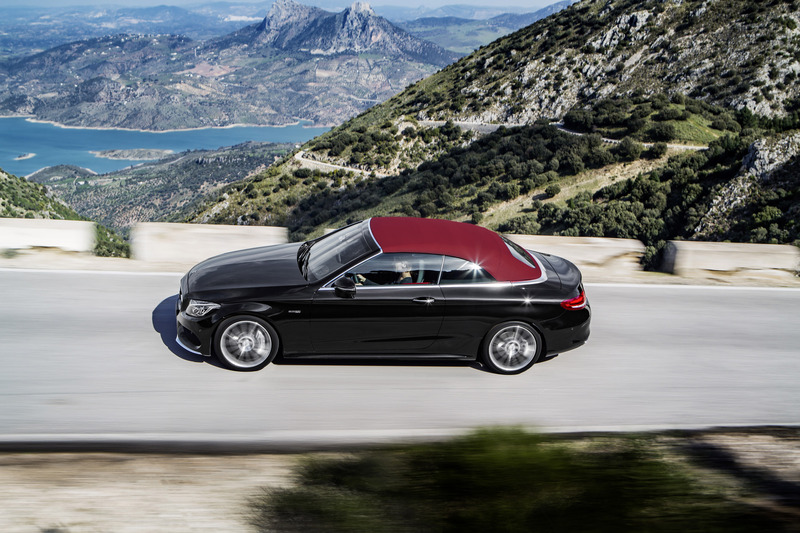 Further distinguishing features include the new "BITURBO – 4MATIC" lettering on the front wings as well as the "AMG" and "C 43" lettering on the left and right of the boot lid respectively. Customers are also able to order the optional Night package, which includes dark-tinted thermal insulation glass from the B-pillars to the rear, a trim element in the front apron in high-gloss black, a diffuser-look insert at the rear in high-gloss black and two tailpipe trim elements in black with centrepiece. AMG 5-spoke light-alloy wheels painted in high-gloss black with a high-sheen finish round off the design visually. Size 225/45 R 18 tyres on 7.5 x 18 light-alloy wheels are fitted at the front, while the rear axle comes with 245/40 R 18 tyres on 8.5 x 18 wheels. Attractive 48.3 cm (19-inch) light-alloy wheels in various designs are optionally available for even greater individualisation. The enhanced lateral support offered by the sports seats keeps the driver in a secure position even when pushing the car to its limits. The upholstery in ARTICO man-made leather/DINAMICA microfibre and the dashboard in ARTICO create an exceptionally sporty ambience. The man-made leather is also used on the beltlines, the armrests, the door centre panels and the centre console. Red contrasting topstitching, designo red safety belts and black floor mats with red edging add attractive highlights. The trim in light longitudinal-grain aluminium embedded in the dashboard and the doors provides effective contrasts. The AMG instrument cluster delivers all relevant information in a clearly arranged layout optimised for a dynamic driving style. An authentic sports car look and feel is provided by two tube-shaped round dials, 11.4 cm (4.5-inch) multifunction colour display, RACETIMER and 280 km/h scale in chequered-flag design. 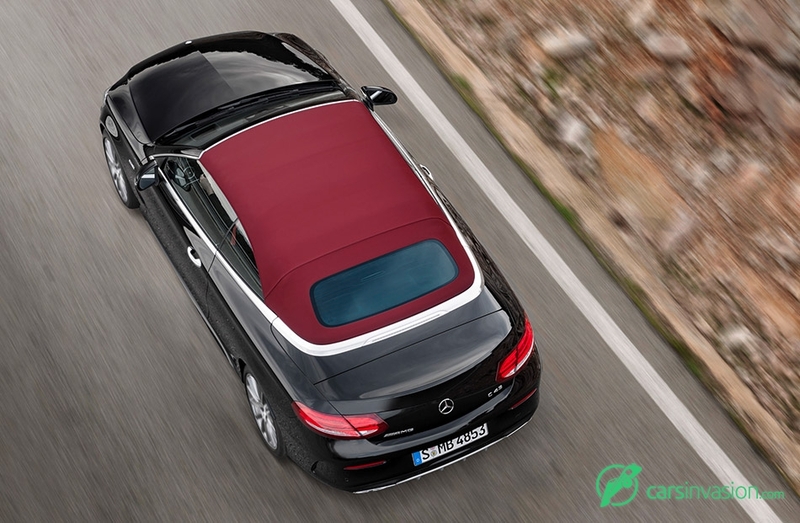 Suitability for everyday use is additionally enhanced by intelligent comfort functions such as optional AIRSCARF neck-level heating, operation of the fabric soft top while driving (up to 50 km/h, initiated below 5 km/h) and optional automatic closing of the boot separator. Exclusive options include the fully automatic fabric acoustic soft top, which is available in black, dark blue, brown or dark red. The multi-layered structure incorporating various insulation materials effectively reduces ambient noise and thus reduces the interior noise level.